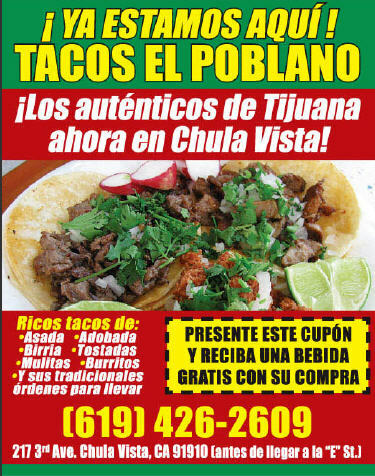 From Sinaloa to Sonora to San Diego every time I order a Taco Gobernador (Governor) I can almost guarantee I will be getting something different at each establishment. 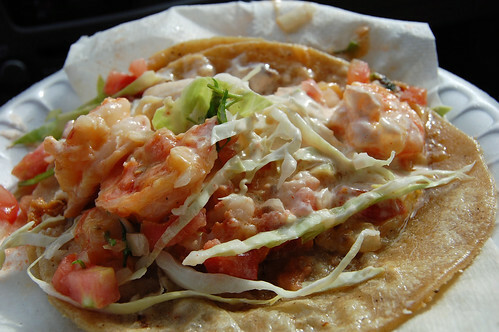 The Taco Gobernador is said to have originated in Sinaloa Mexico and named after an ex governor of Sinaloa. 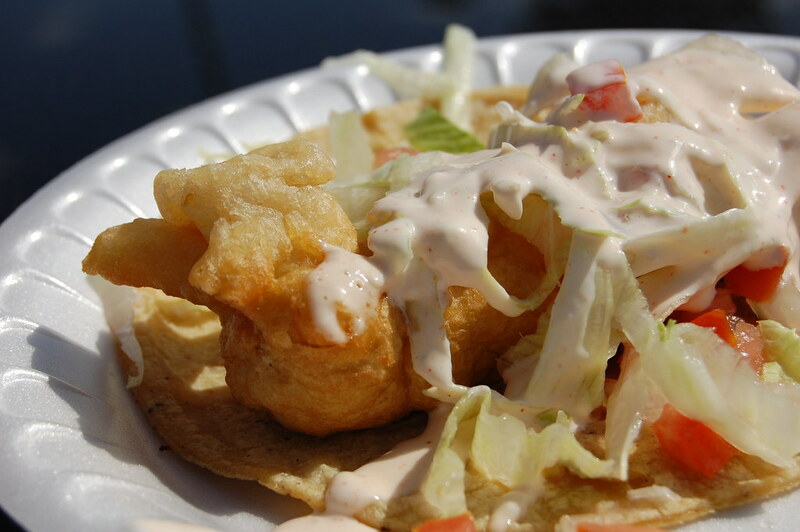 The first version I tried was in Sinaloa and had a combination of shrimp, marlin, and cheese. Over the years I have had countless renditions with only one common denominator “Shrimp”. With my travels to Mexico limited for a few months I decided to put some Gobernadors in San Diego head to head so I grabbed my brother, jumped in the car, and let the games begin. 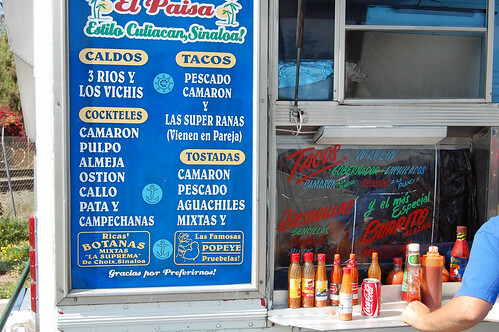 It should be no surprise my favorite gobernadors come from mobile trucks and not restaurants. First stop Mariscos German 35th and University San Diego. I have tried almost all of Mariscos German locations and they are pretty consistent across the board. 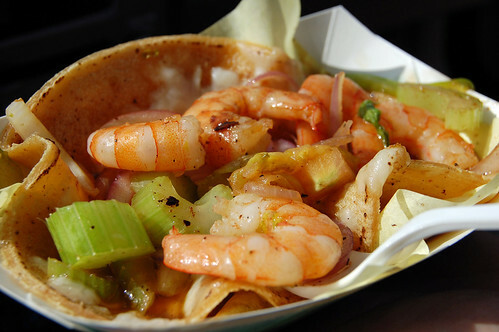 Mariscos Germans Gobernadors consist of Red Onion, Cilantro, Celery, Shrimp, Cheese, and Tomato. Overall I find no faults in this taco and it has been a long time favorite of mine. The Shrimp was cooked to perfection with just the right amount of seasoning and the veggies and cheese grilled just right. This still stands as my number one choice for this style of taco. Second stop Mariscos El Pescador Chula Vista. Mariscos El Pescador in Chula Vista is my usual Fish Taco stop but I decided to see how their gobernador stacked up to Mariscos German side by side. The Gobernadors at El Pescador are very similar to Mariscos German. 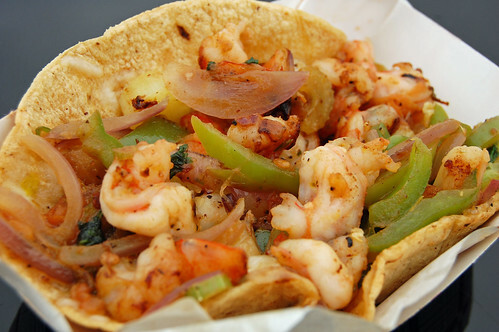 El Pescadors Gobernador consist of Shrimp, Bell Pepper, Celery, Onion, Cilantro, Tomato, and Red Onion. If you’re taking notes Bell Pepper is the only difference from Germans version. Another difference on Pescadors gobernador is they butterfly the shrimp. My only faults with this version is I feel it needs less seasoning and vegetables. Defiantly a top contender in the Gobernador throwdown, and on this day and a close second. Third stop Mariscos El Paisa San Ysidro. 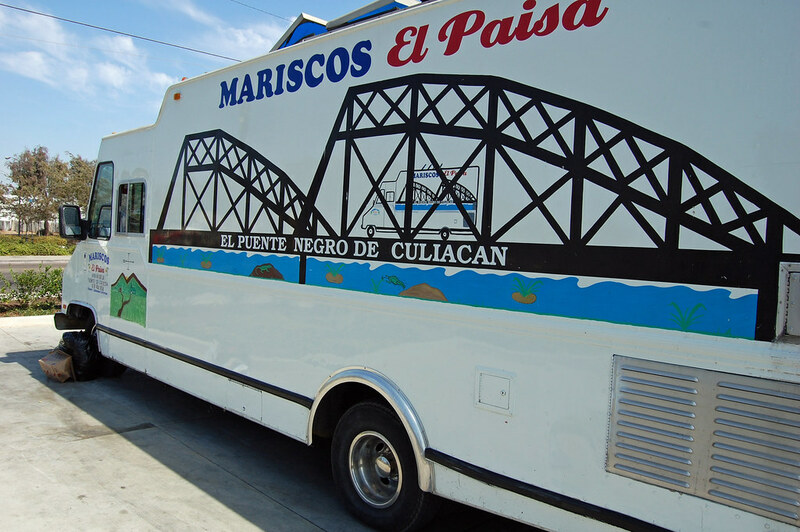 We worked our way south to San Ysidro and decide to check out Mariscos El Paisa. With Mariscos German representing San Felipe and El Pescador representing Ensenada I knew the representation from El Paisa (Culiacan Sinaloa) would be different. This version had no grilled vegetables and consisted of just shrimp, tomato, lettuce, cilantro, and crema. The shrimp was succulent and the taco was double wrapped in some quality tortillas however their was way too much crema for my taste. Although the crema was very tasty it just totally took over. Next time I order one from here I will be sure to ask them to go easy on the crema. A minimum of two tacos come in one order which is actually a bargain at $5.00. I believe Mariscos German and Mariscos El Pescador are in the $3.75 each range. All and all a good day for a shrimp lover like me. I’m sure there are many more great Gobernador tacos out their, if you have any favorites I didn’t mention I would love to hear about them. Its gets very interesting when you judge tacos side by side. It was also great to get another perspective, my brother also agreed at MG 1, Pescador 2, and Paisa 3. A taco truck that has two waitresses??? What??? Well technically according to the Webster Merriam Dictionary the definition of a waitress is “a woman who waits tables (as in a restaurant)”. Well this is not a restaurant, and no tables are in site, but it gets so busy here they have a team of two outside the truck that take your order and serve you. I’ve been to an abundance of taco trucks and I have not seen an arrangement quite like this. If it gets that crowded “it must be good”, right? Especially when Mariscos German on Beyer Ave is a stone’s throw away. In San Diego Mariscos German has long been my bench mark for Seafood Tacos, followed by Mariscos El Pescador for Fish Tacos. 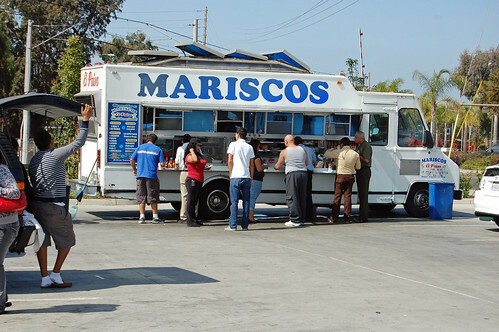 So how does Mariscos El Paisa stack up???? 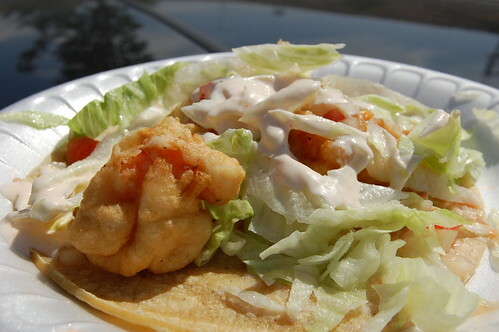 I’ve had everything on the Menu at Mariscos German and 90% of El Pescadors so it would not be a fair comparison at this point, however I will tell you the Fish and Shrimp Tacos are definitely worth a try at this point. With one stop already under my belt I ordered only two tacos, I’m glad I did because the tacos were huge. Now “taco purist” may scoff at the use of lettuce rather than cabbage on Fish or Shrimp Tacos but I must say in this case it worked well. The fish and shrimp were both fresh and plump. The crema was tasty and unique and the lettuce and tomatoes were fresh. Other then the tortilla falling apart it’s defiantly worth your buck. I typically order beyond the basic Fish and Shrimp so I’m eager to get back this week and sample the rest of the goods on the menu. The menu is not very extensive however a few things on the board captured my attention. 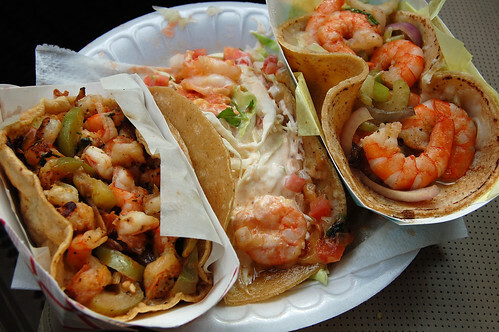 I’m eager to check out their Gobernador Taco which is usually grilled shrimp with melted cheese but has varied at every Restaurant or Taco Truck I have tried it at. I’m not a huge Burrito fan but the Alazan sounds interesting. At first look I thought the “Super Ranas” was going to be frog leg tacos however the Super Ranas is a taco with melted cheese Marlin, Octopus, Shrimp, and Fish with a minimum order of two. I also look forward to sampling their Caldos (Soups); I just hope I have room for it all. I will update this report as soon as I try more of the fine offerings representing Culiacan Sinaloa Mexico. This may be too far south for some but if you’re in the area check it out, it’s been here years and is here to stay. Spanish helps. Chiles en Nogada is probably my favorite Mexican dish of all. I had have versions at Restaurants in the past but nothing has compared to this homemade version. My wife and I were first inspired to make this after reading a post on Chowhound last year. Agustin de Iturbide was a military commander who fought in Mexico's War of Independence, and later went on to become Emperor of Mexico in 1822. Agustin signed the treaty of Cordoba that granted Mexico its Independence. On his way to Mexico City, Agustin stopped in the city of Puebla where the townspeople decided to hold a feast to celebrate the Independence from Spain and Iturbide’s saint’s day, August 28th. The Augustinian nuns of Santa Monica convent were in charge of creating a special dish for the occasion. Using local ingredients that were in season they came up with a dish that proudly bore the colors of the Mexican flag; in this dish were the green chilies, the white sauce, and the red pomegranate seeds. 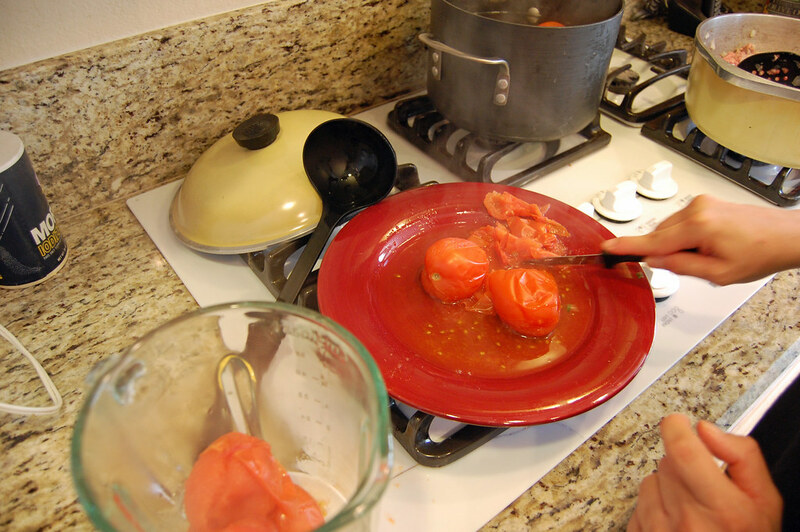 Cover tomatoes with water and simmer until soft about 10 minutes, Remove skin from tomatoes and blend. Line large pot or skillet with cooking oil; add whole crushed garlic, onions, and jalapeño. 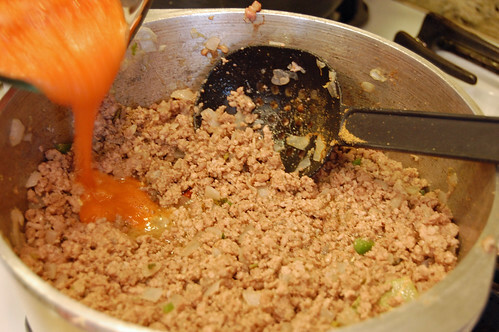 Stir in ground pork and beef and cook over medium low heat until meat is browned. Salt to taste, add pinch of oregano, cinnamon stick, and bay leaf. Add the tomatoes and salt to taste. Stir in the raisins and chopped walnuts. 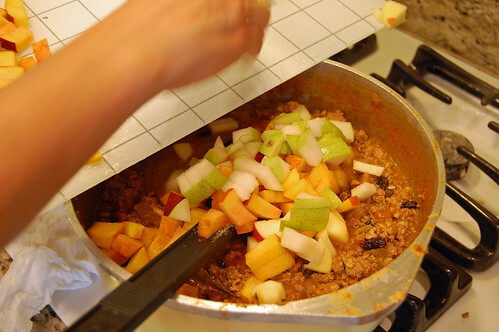 After several minutes add the chopped pear, apple, plantains, and mix well, continue cooking over medium-high heat until most of the moisture has evaporated. Stir often let cool, cover, and set aside. 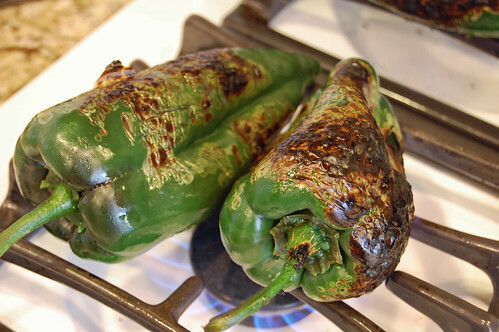 Smear a light coating of vegetable oil on the poblano chile, directly place chile over an open flame. 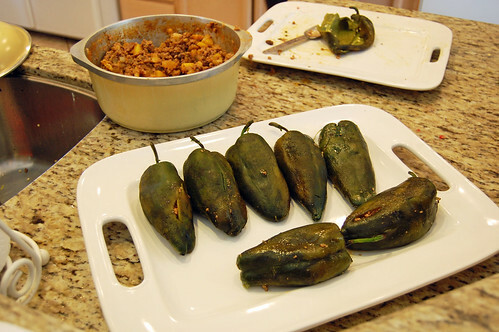 Turn the chiles from time to time to allow skin to blister and char lightly. Place them immediately into a plastic bag or seal with plastic wrap and leave them to sweat for about 10-15 minutes. This allows the skin to moisten. Remove skin and clean off with the edge of a spoon. 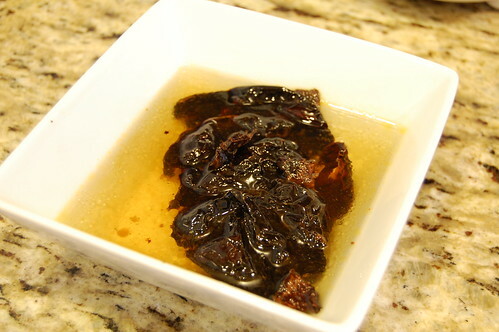 Make a slit in the side of each chile and carefully remove the seeds and veins. Gloves are recommended; we also recommended you do not rinse the chilies. 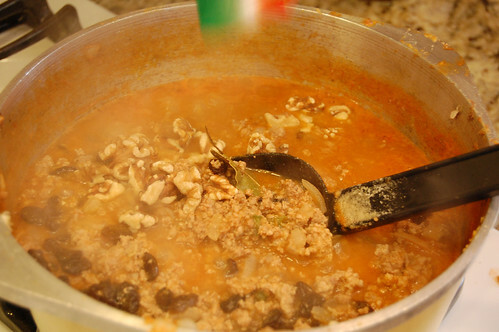 Blend the crema, milk, queso fresco, pecans and walnuts until smooth. You can play with the amounts of cheese and milk until you get your desired consistency. 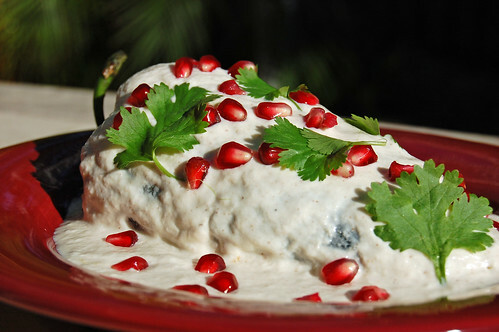 Cover the chiles in the nogada sauce and sprinkle with fresh cilantro and pomegranate seeds. Here is a video from last year which was made with the help of the author of the original post from chowhound. We pretty much stuck with the same recipe with exception of the nogada was made with water instead of milk on the video. 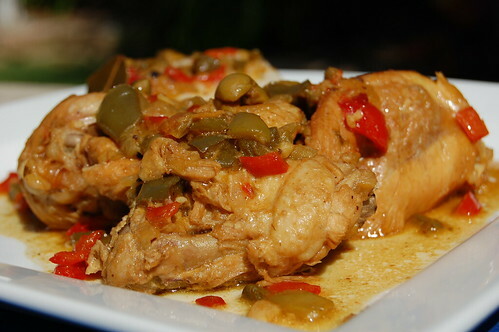 Chiles en Nogada is a very complex dish that maintains a pleasing balance between the savory and sweet. We love serving it to guest and have them guessing the ingredients. If you have any questions regarding the preparation feel free to leave a comment. 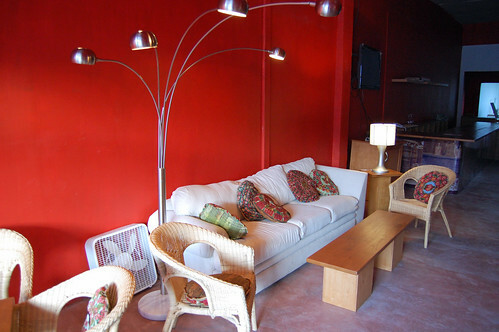 I had a chance to stop by Ensenada’s newest bar UltraMarino Bar a few weeks ago. I’m a big fan of their sister restaurant Barra Azul and was curious what menu options they would bring to their new Bar. Ultra Marino is a Bar first and foremost but I was pleased to see I could get my tempura battered oyster fix here. 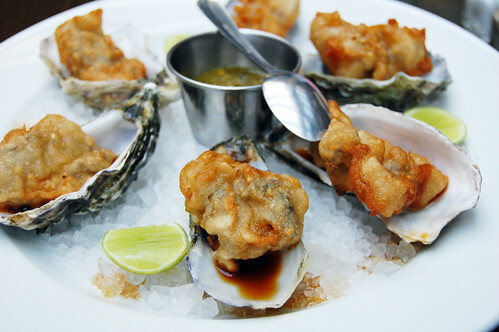 The presentation differs from the picture below(Taken at Barra Azul) but the taste is identical. They serve a wide variety of drinks including some interesting martini offerings that include oyster flavor. 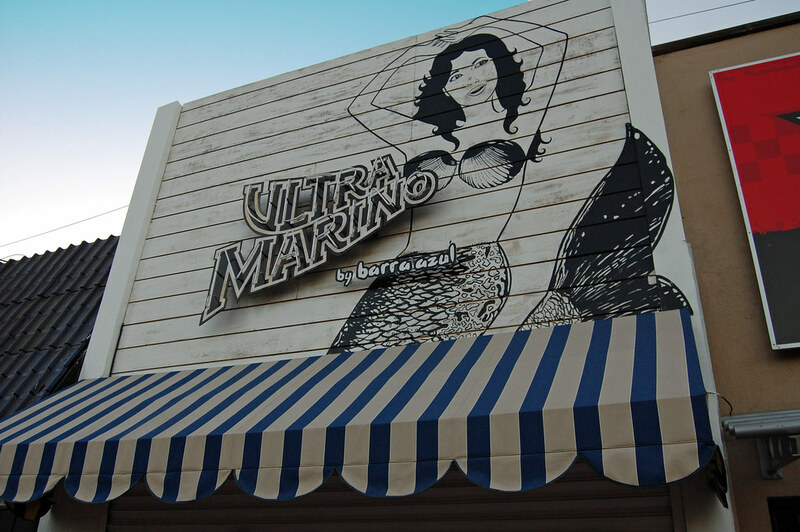 UltraMarino is Located at First and Ruiz. 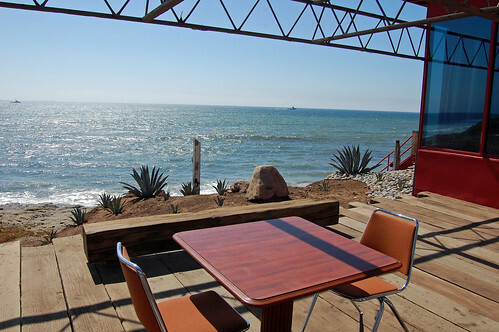 Last month Jay (The Linkery Restaurant in San Diego) informed me about a new a restaurant on the coast of El Sauzal Ensenada called Gazuza. 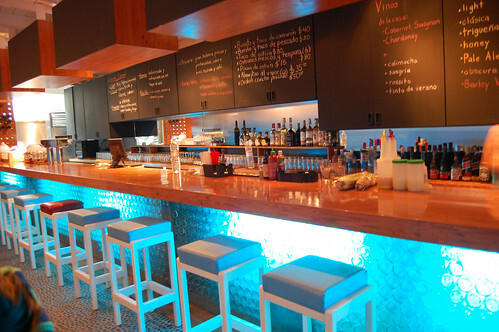 Gazuza is located at the same location the Oaxacan Restaurant at Viento was previously located. They actually moved it closer to the coast the scene is breathtaking. I hope to get back their soon and provided a full report. Thanks Jay. 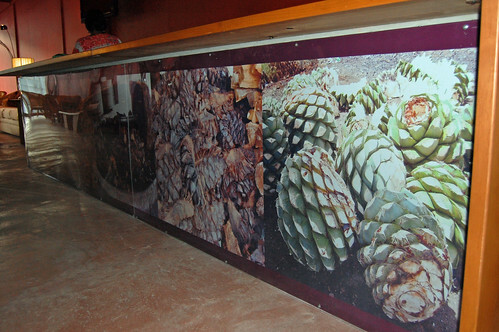 I’m very excited about the new Mezcal bar “El Agave” opening in Ensenada. 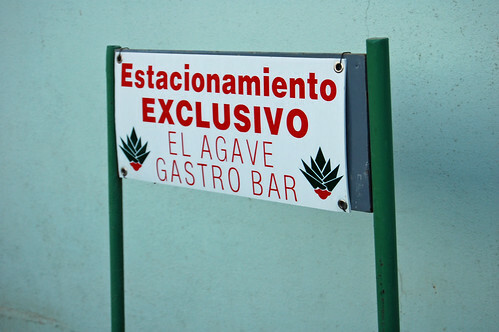 El Agave is owned and operated by Laura and Chava who at one time owned the Oaxacan restaurant in El Sauzal Ensenada. This will be a place to sit back, relax and enjoy an endless variety of Mezcals including Cremas De Mezcal along with some delicious Oaxacan botanas. Primarily produced in Oaxaca Mezcal (or Mescal) is a Mexican spirit distilled from the agave plant. 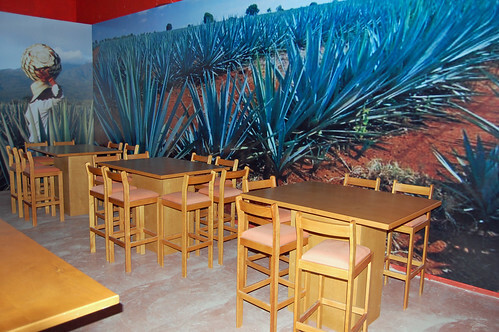 While some tequilas may contain 51% agave all Mezcal must contain 100% agave. If you have never tried Mezcal it has a smokier taste then tequila. 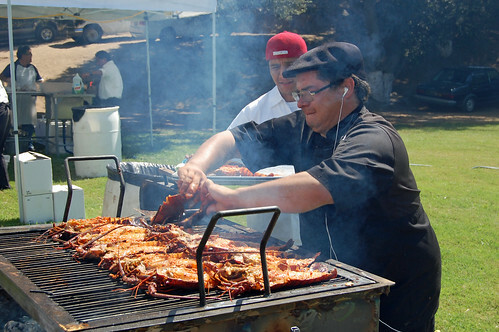 The Smokey taste comes from the production process of roasting small batches of agave in an earth oven. I find sipping on premium Mezcals very delightful and enjoy their complex full flavors and aromas. 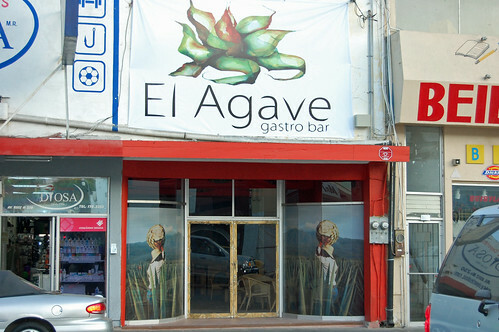 I had a chance to take a sneak peek at El Agave which will be opening soon. It’s just past 2nd Ave on Ruiz just a stone’s throw away from my favorite bacon wrapped hot dog cart. If you cannot find parking on the street they have 3 reserved spots directly across the street. 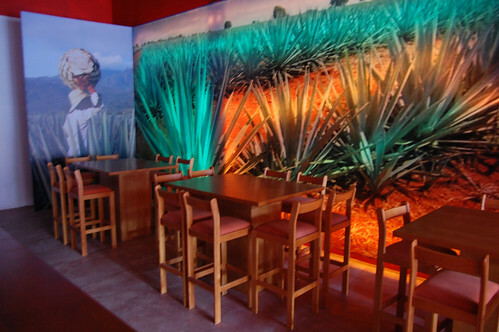 The inside has a nice warm vibe with couches inviting you to sit down, relax, and sip on some premium Mezcal. The bar area sports some very cool pictures of the Mezcal production process and will soon be lined with premium Mezcal and more. They have very cool back lighting of the Agave I tried to capture on my camera. Every time you are served a Mezcal you will receive a pairing with some Oaxacan Botanas. If you have not had a chance to try Laura and Chavas cooking you’re in for a treat, along with their home style cooking their hospitality is unmatched. If Mezcal is not your thing they will also be serving some artisanal beers and more. I hope to be posting more details about the opening soon, see you their. Layers of soft yet crunchy fried tortillas dripping with red sauce, topped with crema, queso fresco, red onion, cilantro and served with over easy fried eggs, I really can’t think of a better way to start the day then Chilaquiles. 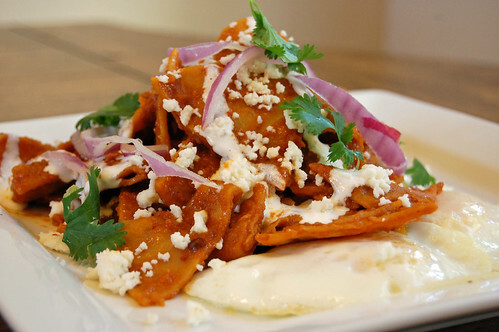 Chilaquiles date back to ancient times and are traditionally made from stale tortillas. 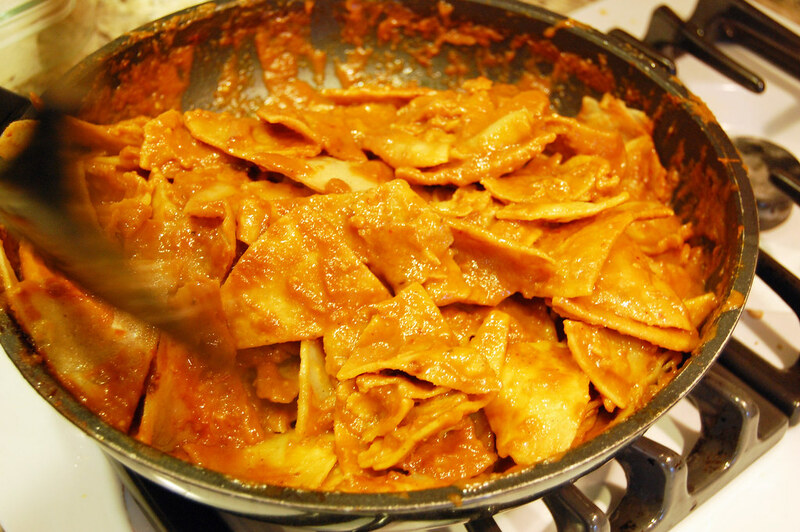 Stale tortillas will absorb much less oil, making chilaquiles a perfect way to use leftovers. After the basis of stale tortillas everything else is influenced on regional and personal preferences. After reading about Diana Kennedys Chilaquiles Veracruzanos in her Essential Cusines of Mexico book I asked my wife if she remembered her grandmas Chiliquiles recipe. Her Grandma was raised in Veracruz and the recipes turned out to be very similar with exception of a couple of ingredients. Heat the oil in a skillet. Fry the chile for about 1 minute on each side. 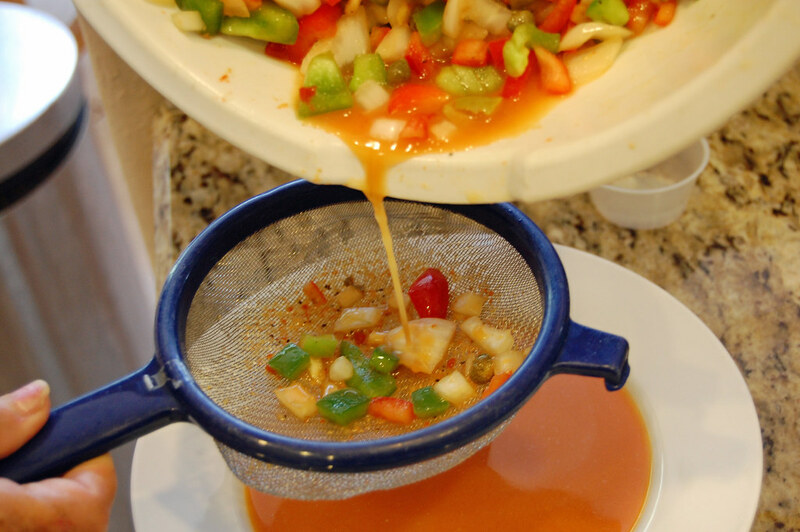 Remove the chili, cover with hot water, and leave to soak for 5 to 10 minutes. 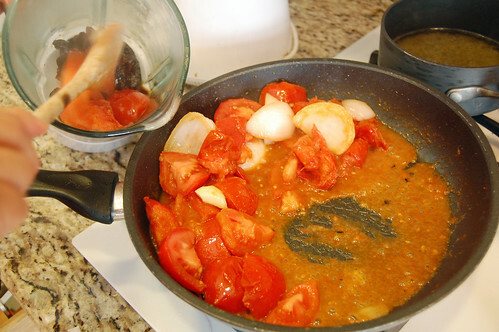 Add tomatoes, onions and garlic to the same pan and grill until they are softened. 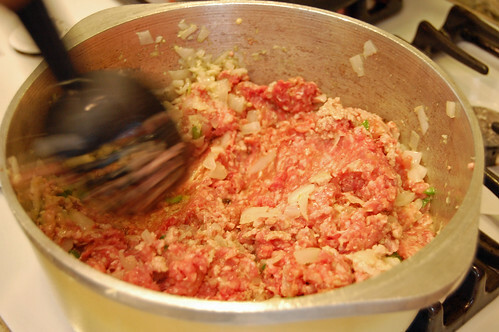 Transfer the drained chile, tomatoes, onions and garlic to a blender and blend until smooth. Reheat the oil and add the sauce, season with salt and cook over moderate heat, stirring occasionally, about 4 minutes, add the broth and cook for 1 minute more. Remove from the heat and keep warm. 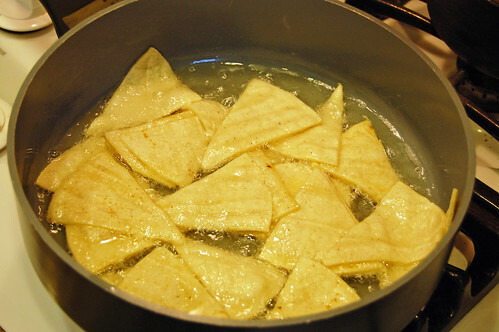 Heat the oil and fry the tortilla pieces, about one third at a time so they cook evenly, until they just stiffen but do not brown, about 3-4 minutes a batch. 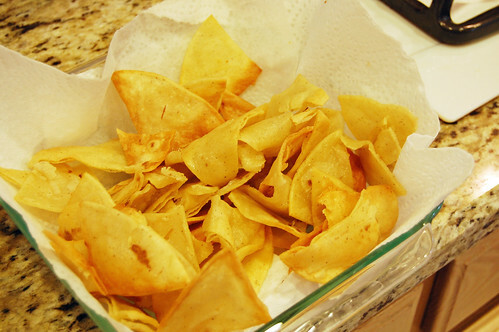 Transfer the fried tortillas to paper towels to drain while you fry the rest; add a bit more oil to the skillet and lower the heat if necessary. 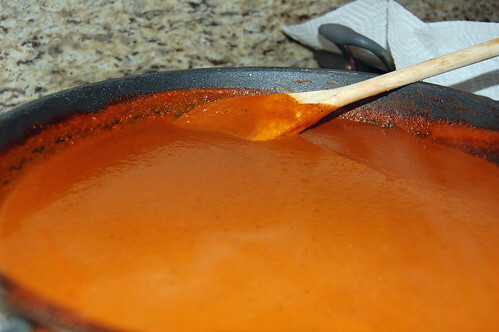 Stir in tortillas and cook over medium heat for 5 to 8 minutes, or until most of the sauce has been absorbed, allow just enough time for tortillas to absorb the salsa. Stir Constantly, the tortilla pieces should be soft yet crunchy. Serve immediately and top with crema, cilantro, and red onion. I love mine served with Over easy fried eggs. As August came to end I look back and see I had my least productive month of Blog posting, August was just such a busy month with family, training, work and fiestas. 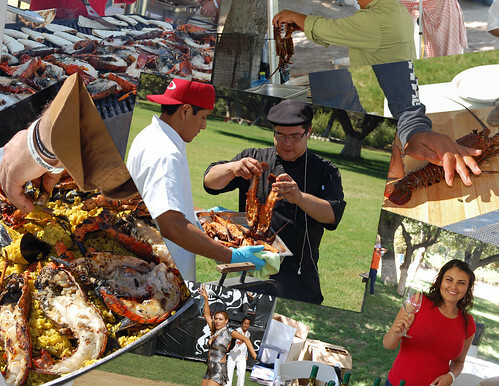 August is the month of Fiestas in Ensenada know as Fiestas de la Vendimia. 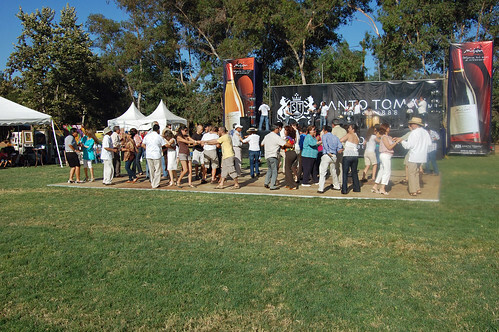 More than thirty events are held over a sixteen day period during August showcasing wine, food, music and cultural events throughout the region. 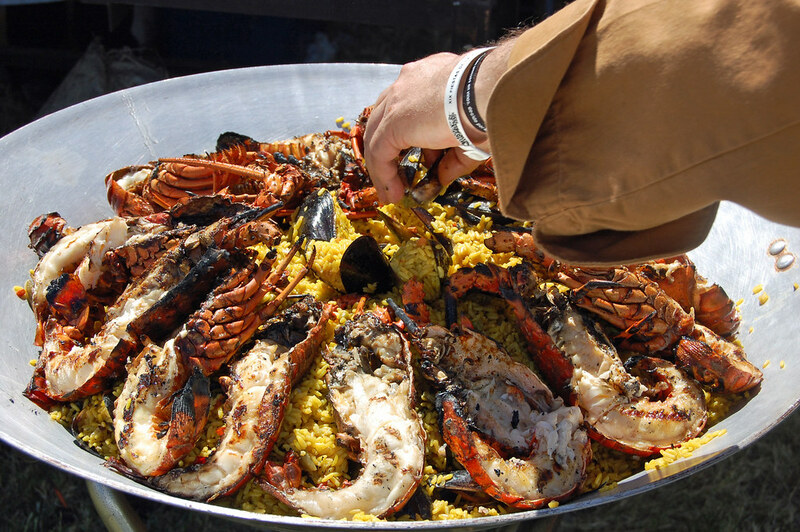 I was lucky enough to attend the Lobster and Wine Chardonnay Festival held at Santo Tomas Winery and had a fantastic time. 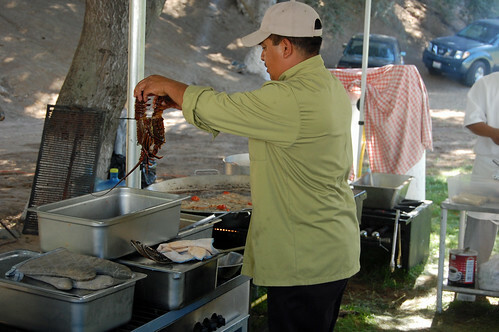 When I arrived I noticed Chef Fabio Lira of La Cocedora de Langosta performing his mastery on the grill with some fresh Baja Lobster. Fabio was on the grill nonstop for hours and hours and I will say one thing, Fabio definitely knows his way around the grill. 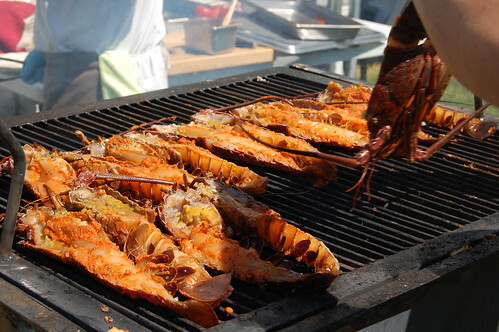 I which I could replicate the aroma from all the succulent grilled lobster, it was very inviting. This Fiesta was all about the Langosta and Vino (Lobster and Wine) but I must say Caprichos makes a burger that can stand with the best of them. 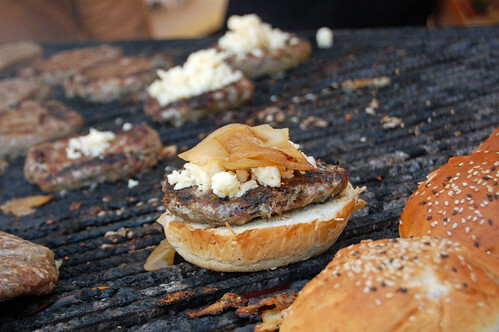 The burger starts with Grilled Sonoran beef and local Real del Castillo cheese, that combination alone is special. Deep fried lobster Puerto Nuevo Style was also available to order, I’m not sure who the vendor was but their Lobster was a very popular choice amongst the crowd. 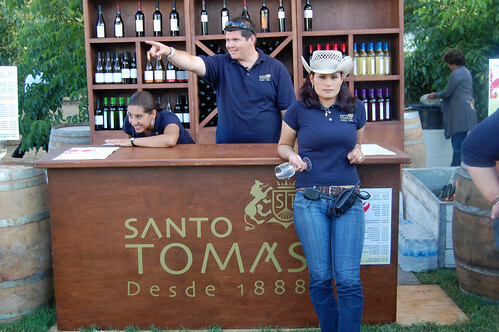 Wine was free flowing from Monte Xanic, Vinistera, Santo Tomas, L.A. Cetto , and much more. With the flow of chardonnay and the rhythm of the Cuban band the Dance floor was buzzing with people sharing good times. Besides the Lobster and Wine some very nice Mexican Art was on display. If you would like more information on the Fiestas my friend Steve Dryden usually puts something out before the events so be on the lookout. I also came across a nice article by a local San Diego writer Amy Wine here. Next year I hope to make much more events, and I highly recommend you join the fun. The people of Ensenada sure know how to throw a party. My Mom had been in Cuba for over a month and I not only missed her but I missed her cooking. 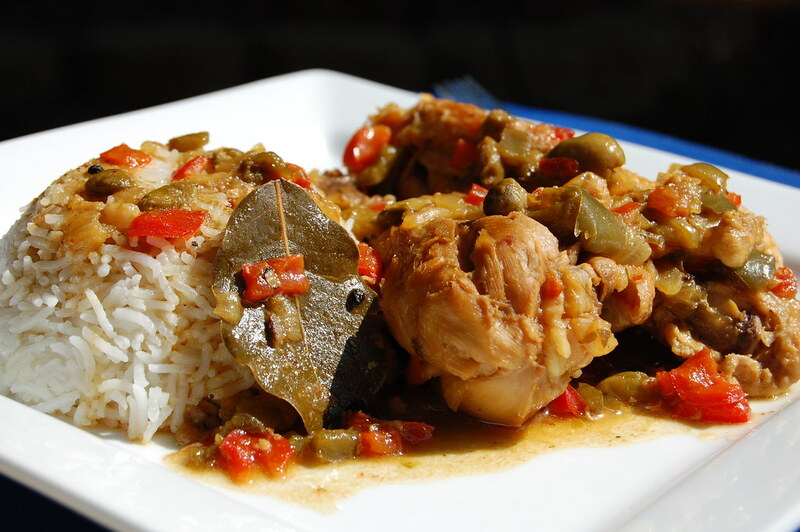 I have been craving my Moms Chicken Fricasse and as soon as she got back from Cuba she came over and shared this long time family recipe. 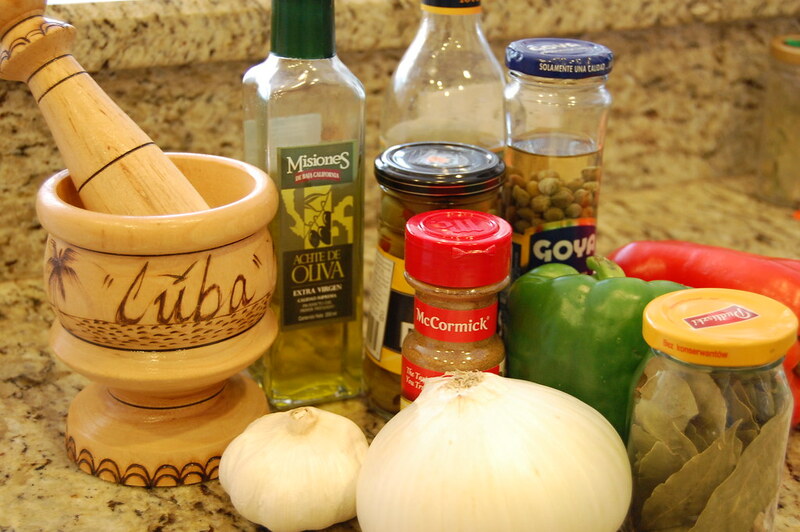 As with any traditional Cuban recipe you will find some variances on some of the ingredients used. I have seen many Chicken Fricasse recipes use a tomato base, but my mom never used a tomato base and I'm fine with that. To me this dish was perfect as is. 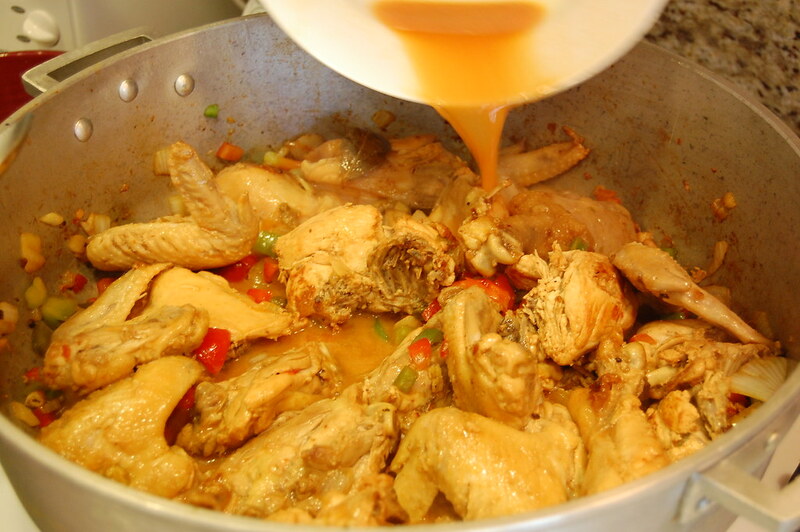 Season individual chicken pieces with salt. 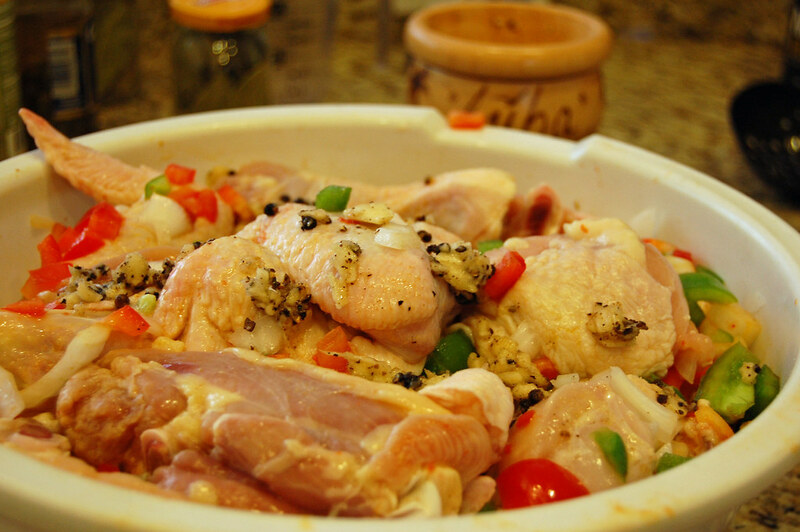 Add all ingredients in a container, cover and refrigerate 1 to 2 hours. 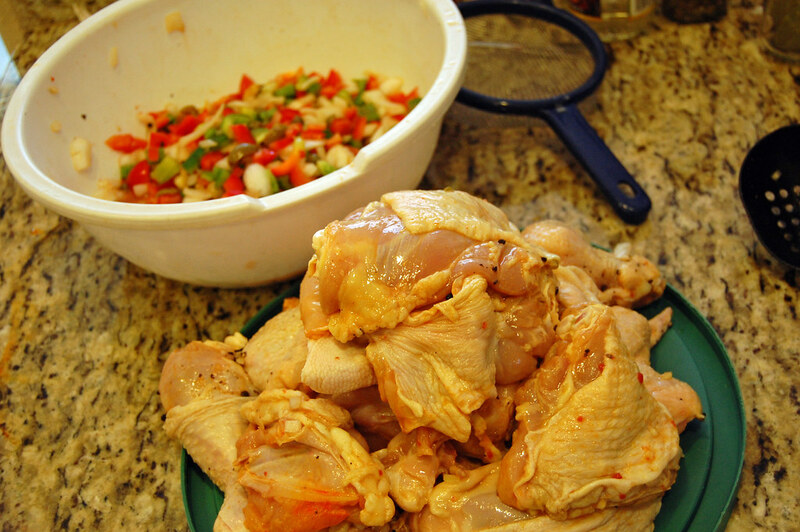 Remove chicken from the marinade. Strain and reserve marinade juice. Warm the oil in a large Dutch oven over medium heat and brown the chicken pieces. 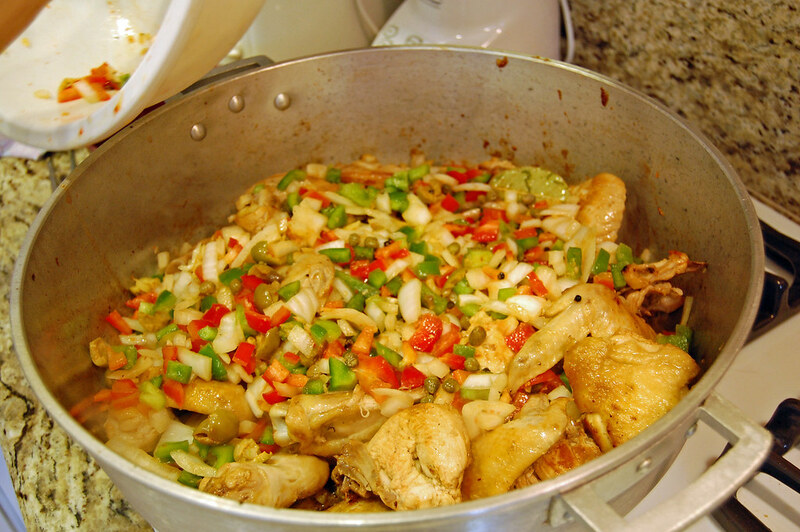 Pour into the pot all of the remaining ingredients , sauteing with the chicken until onions are translucent, about 3 -5 min. Add reserved marinade juice. Reduce heat to low, cover pan and simmer for 30 min.